We’re finished with Week 1 in the British Premier League, oh wait, I’m being told that sponsors are already angry, sorry, that’s the Barclay’s Premier League, my mistake, and it is the best league on earth. Our recap of the first weekend’s matches is much too long and has way too many out-there allusions and correct opinions, so maybe you should just skip to read about the team you like, or, rather, you could just read all of it. And without further Freddy ado let’s get started. 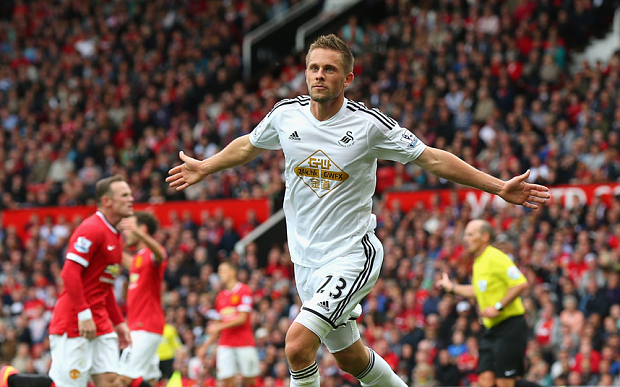 Biggest Surprise: Manchester United lose to…Swansea City?! Louis, Louis, Louis. SMH (which means “shaking my head” in tween girl talk). This loss was to a side that couldn’t muster a win against any of the top nine finishing teams in the league last season. And it was at home, at the sacred ground of Old Trafford. Besides one moment of brilliance and almost another from new captain and consistent star Wayne Rooney, Manchester United did not look good in their first real game with new manager, Louis Van Gaal. This image has sadly become consistent, like a repeated commercial within one advertisement break or a recurring bad dream that won’t stop: Wayne Rooney playing masterfully at the forward position while his team manages to lose the match around him. We saw it in each of the last three world cups, and we’re now starting to see it for Manchester United. For the pudgy-faced Liverpudlian’s sake, we hope something changes at Old Trafford soon. It sounds like United won’t get Angel Di Marìa who understandably doesn’t want to leave Madrid for Manchester—who would?–but the Red Devils have managed to sign Argentine defender Marcos Rojo who should help to shore up the sagging defense that Swansea City exploited beautifully. The 29 passes in the build up to Swansea’s second, game-winning goal were more than any Premier League goal all of last season. Twenty-four year old midfielder Gylfi Sigurdsson dominated the game with his control of the middle of the pitch, assisting the first goal and scoring the second. Sigurdsson celebrating his game-winning goal with an agonized Rooney in the background. While Swansea fans chanted about how Van Gaal would be sacked in the morning, the Dutch manager’s post-game analysis was spot on: He said that in the first half, “we were nervous,” and in the second half, “we never played as a team.” Yup, pretty much sums up the Red Devils’ performance. The aftermath of the match is a genuine tale of two teams with Man U looking to forget, deconstruct, and move on and Swansea looking to repeat, build, and forge ahead. We can safely assume that United will finish ahead of the Swans by season’s end, but let’s take it one match at a time. This is a must-win match for the only U with zero academic standards. If Crystal Palace counts as a London team, which they shouldn’t—that would be like saying the New Jersey Nets counted as a New York team when everyone knows the franchise was devastated to leave the North Jersey Meadowlands for Brooklyn’s Barclay’s Center—then there was one London team that played alright, at least under the circumstances. Even after losing their manager less than 48 hours before the opening match of the season, Palace played with heart, if not skill, scored first against powerhouse Arsenal, and were unlucky to give up the deciding goal in stoppage time. Arsenal, on the other hand, found a way to win but never impressed at any point in the match, causing the Gunners fans I was watching the match with in an East Village pub to repeatedly yell at the television in anguish. They seemed to believe that with new signings and no injuries, it was finally their season, but that damned tele showed them otherwise. The match changed when French forward Olivier Giroud came on, a sign of hope for the squad, and he will have to be a starter in Week 2 against Everton. QPR looked poor at home against a Hull City side that only finished two places above relegation last season. Veteran manager Harry Redknapp was not pleased. He never is pleased actually, but he’ll be even more unpleased this week. 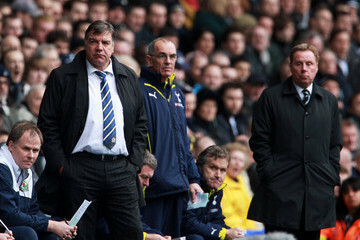 Allardyce and Redknapp just being themselves. You wouldn’t know it from the scoreline of their first match, but Southampton played the best opening weekend soccer of any team not named Chelsea. During a long stretch of the second half, the Saints dominated possession and were creative, making it impossible to discern the supposed gaping holes in their lineup left by key departures. In the offseason, Southampton lost the core of last year’s 8th place team: Adam Lallana, Dejan Lovren, and Rickie Lambert all went to Liverpool, Calum Chambers to Arsenal, and Luke Shaw to Manchester United. However, this new-look side played as a cohesive attacking unit and only gave up goals because of England star Raheem Sterling’s touch of finishing class in a goal and an assist. But back to Southampton…The Saints’ link-up play on both sides was something to behold, as were their deft backheel passes in the box, which led to right back Nathaniel Clyne’s goal and another similar chance in the 68th minute. They were just flowing, as good teams can do, like a good stand-up comedian who gains momentum and is kind of entertaining most of the time until he punches you in the gut with a moment of hilarity. Southampton had their flow and their moments and were the most fun team to watch in England this past weekend. A typical sequence for the Saints would be a throw in which would find a header up to midfielder James Ward-Prousse, who finds Dusan Tadic streaking forward into open space past his defender on the left wing. There would be a give-and-go back to Ward-Prousse in the box now, as swarming Liverpool defenders seem only capable of static admiration for Southampton’s play. Ward-Prousse finds Steven Davis in the middle, and Davis controls the ball but is unable to muster a powerful shot. These are names you should remember and look out for as the season continues. Was Liverpool manager Brendan Rodgers excited about the win? Yes. Should he be? No, not at all. With Louis Suarez, the Reds won 3-0 at Southampton last season. Without him last year, they lost to the Saints 1-0. Without him this year, they relied on a set piece for the winning goal and were thoroughly outplayed in the second half. If this match means anything, Southampton have nothing to worry about, and Liverpool will have to fight like Cady Heron if they want to keep hangin’ with The Plastics. Are the Saints for real this year? Chelsea were simply far and away the best team in week one. Manchester City’s calm win over Newcastle was also impressive but that match was only 1-0 until Sergio Aguëro’s goal in stoppage time. Chelsea responded to an opening goal from Burnely quickly and effectively, and the Blues’ midfield looks absolutely unstoppable. There were surely moments when fans of the Brazilian national team suffered bouts of déjà vu and stood up to scream at the television, “Not again!” when Chelsea midfielder André Schürrle appeared to be back within the German goal-producing machine, almost recreating the 7-1 World Cup bloodbath. On one such occasion, Schürrle finished a perfect pass from star midfielder and offseason signing Cesc Fabregas, who had received a cross from right back Branislav Ivanovich after last year’s top player, Eden Hazard had dribbled through the hapless Burnley defense. Hazard is still the team’s best dribbler and energizer bunny. The combination of Hazard, Fabregas, and Schürrle along with in-form forward Diego Costa and the recovering Brazilian youngster Oscar makes for the most potent attack in the premier league on paper and now in real life too! Schürrle’s goal really must be credited to Fabregas—one of those goals which was really an ASSIST followed by a goal. It knocked the keeper’s water bottle out of the Burnley net and prompted the NBC Sports announcer to boldly claim, “I do not think there will be a better pass this season.” Audacious for week one. Especially when this guy Fabregas has over 30 more league games to play. Of course it’s weird for Chelsea fans to cheer for Fabregas, who played eight long seasons for cross-town rival Arsenal, where he made those kinds of passes and scored goals against his current club. He may have gone back to Arsenal too for this season except for the fact that the Gunners already have Aaron Ramsey playing in Cesc’s midfield passer position. What warms Blues fans up to an old enemy like Fabregas, and Costa for that matter—the man who single-handedly knocked Chelsea out of the Champions League while playing for Atlético Madrid last season—is goals and wins. The two Spaniards provided both in Week One, and with old hero Didier Drogba coming on in the 84th minute, Chelsea supporters couldn’t be happier. Don’t scoff! The Foxes drew with a strong Everton side in Week 1. As we all know, teams near but not quite in the very top of the table—like the school kids on the periphery of the cool group but unable to make the final leap to the in-crowd—will all be fighting madly throughout the season, trying to impress the cool kids by beating them and slyly slipping into the top 4 or 6 teams. These places are highly coveted seats at the table of European competition—the Champions League and Europa League—each of which carry immense prestige and financial benefits. But before we think about who can succeed in Europe, let’s take a moment to think about what teams might have a shot at earning their place at next year’s European feast, that is the teams that have a shot at finishing in the top 4 or 6 in the Premier League this year. Going into the season, the most popular ordering was probably: Chelsea, Manchester City, Arsenal, and Manchester United with Liverpool and Everton rounding out the top 6. Although Liverpool finished 2nd last season, they lost the unstoppable goal scorer Luis Suarez, who scored 31 times in 33 league matches. Liverpool Striker Daniel Sturridge may say that the team doesn’t need Suarez to be as good as they were last year, but he’s lying. Of course, it’s a lie he has to make, so no ethical judgment here, but the Reds will surely miss their star striker of the last 4 seasons and will undoubtedly drop spots to at least Chelsea and probably Arsenal as well. The Gunners should be strong with a midfield that now includes Chilean World Cup sensation Alexis Sánchez alongside a healthy Aaron Ramsey, hopefully for a full season, but again, their initial performance was shaky. It is still unclear if this midfield will be able to gel and reach its potential. That leaves Manchester United who had such a dominant preseason, including a 3-1 victory over Real Madrid at the Big House—the one belonging to Michigan Football—that pundits assumed the Red Devils were back to their Sir-Alex-Fergson-plus-Paul-Scholes ways. Again, the squad was not impressive on Day One. If Week 1 performances matter at all–which is a debate on its own– then we see a gaping hole in the standings behind Chelsea and Manchester City, who will not be equaled by any other teams barring multiple injuries and players sleeping with their teammates wives; looking at you John Terry. Who could fill it? Why not Everton? 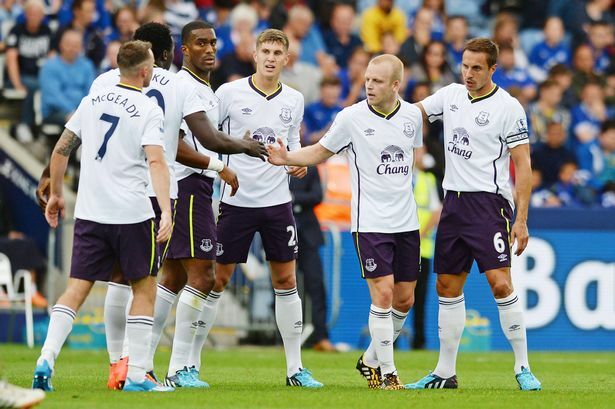 They finished 5th last season and have been improving steadily each year under gifted manager Roberto Martinez. Well, Ross Barkley’s injury could be one reason the Toffees won’t improve on or replicate last year’s success, but the young stud midfielder should be back to action before midseason. What about Everton’s opening match draw to lowly Leicester City? Both teams played well in that match, Everton conceded on a corner, and we can assume that letting in too many goals won’t be a big issue with “The Human Wall” aka American goalie Tim Howard between the posts. If Barkley can return to full strength on time, Everton could surpass crosstown rivals Liverpool and teetering Manchester United in the league this season. With Spurs looking weaker than last year and Manchester United’s class unclear, the sixth spot in the league may also be in contention, and a team like Southampton—even with all of the offseason transfers out of the club—could find themselves fighting for a chance at European glory. We can all get excited and put our party hats on, because this season is going to be a more even, more tenacious, more exciting roller coaster ride than we’ve seen in a while. But as we make premature predictions, it’s important to remember Yoda’s words of advice once again: “Difficult to see. Always in motion is the future”…Except for the top of the table, which is going to be Chelsea and Man City. I mean, it has to be, right Yoda? Ugh, can it just be Saturday again already?